Just a quick reminder to start preparing the photo artyou might like to share at the new photo challenge coming soon here at Pixel Dust Photo Art. 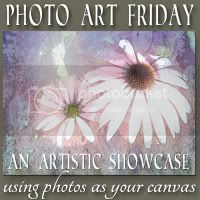 It is called Photo Art Friday and begins the second Friday in September,which is September 9th. To learn more about how to participatesimply click HERE. you can find great ones HERE or HERE. What a great idea. It will be awesome to see collectively what other photo manipulators are doing and am sure will be extremely inspiring. Can't wait! Can't wait for this new challenge to start.